Collins describes discipline as consistency in action. However that suggests that one has a set of standard and guidelines to follow. Do you have a SMaC recipe for your business? SMaC is set of Specific, Methodical and Consistent rules you follow and make decisions by. If not, then demonstrating Fanatic Discipline may not only be difficult, it may be impossible. It is most definitely the difference between being mediocre and achieving greatness. Is it your intention to be mediocre or to strive to achieve excellence? If it’s the latter Fanatic Discipline is a trait you will want to learn and implement. Developing Fanatic Discipline starts with developing rules and policies for your company. Great companies have a formula not unlike the One Page Strategic Plan that provides consistency in values, long term goals, performance standards, method and thus achieve consistency over time. Discipline is not routine or regiment, it’s not measurement. Real discipline rejects the need or constraints to conform in a manner that would be inconsistent with the values, performance standards and long term aspirations of the company. It avoids short term gain by looking toward its guiding principles and SMaC recipe. How many times have events within your business, market dynamics, or economic developments forced or made you respond in a fashion that was not consistent with your values? Has it happened at all? As noted in Have You Defined What Not To Do – Great by Choice SMaC Recipe when faced with declining results, 10Xers do not assume that their principles and methods have become obsolete. Rather they first consider whether the enterprise has strayed from its recipe, or has forgone discipline and rigor in adhering to the recipe. If so they see the remedy in reconnecting with the underling insights behind the recipe and reigniting passion for adhering to it. They ask, “Is our recipe no longer working because we’ve lost discipline? Or is it no longer working because our circumstances have fundamentally changed?” The difference in the 10Xers from the comparison companies is their fanatic discipline. The clarity and specificity of a SMaC recipe helps people keep their bearings and sustain high performance when in extreme conditions. 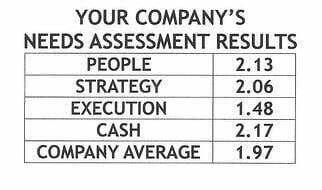 What standards and values are in place in your company? Are you intent on achieving excellence, perhaps even greatness or is mediocrity okay? As an example if a key contributing member of your team were to stray from your Core Values would you reprimand and possibly even fire them for not conforming to your culture? Would an opportunity to gain revenue and profit from a relationship with a customer or vendor who didn’t adhere to your Core Values or required you to ignore or deviate from a Core Value prevent you from proceeding with that decision? Would you ignore and possibly even change your Core Values to earn business? Fanatic Discipline isn’t the only part of this equation. 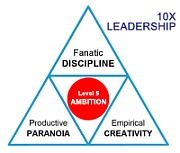 As you can see in the triangle it includes Productive Paranoia, Empirical Creativity surrounding Level Five Ambition. Level Five Ambition may even be the starting point for creating the surrounding elements of 10Xers. Fanatic Discipline requires unrelenting perseverance. It requires an unyielding approach to preserving values and vision. At the same time it requires the discipline to not overreach. When success is achieved it prevents the business from getting greedy and exceeds ability to remain committed to a 20 Mile March philosophy and its SMaC recipe. To be perfectly frank with you Fanatic Discipline is not something that everyone can aspire to. It requires someone who is totally committed, persistent, courageous and possibly even unreasonable and frenetic in their beliefs and point of view. It’s why so few companies become Great. Yet to believe it’s not for you and your company, that it requires something you’re not capable of, or that it means missing out on balance in life with your family and friends is simply not true either. A quest for excellence in your business should make your life more enjoyable and rewarding simply because success and defeating mediocrity is extremely fulfilling. A total commitment to fanatic discipline is not a rejection of living life in balance. In reality it can provide more satisfying relationships and dedication to the true values you enjoy and bringing more clarity to the spiritual and social side of your life as well. Fanatic Discipline is about being clear on values, goals, performance measurements, methods and standards for achieving success with your business. It can provide that same clarity to your personal life as well. In order to achieve the recovery I’ve accomplished with Acute Myeloid Leukemia and Bone Marrow Transplant I’ve had to commit to Fanatic Discipline. What may surprise you when you make your commitment to achieve greatness and employ Fanatic Discipline in your life is how many people rise up to support you in your endeavor. Fanatic Discipline isn’t for everyone. Just for those of us who wish to achieve our potential and enjoy a richer more fulfilling life than others. Level Five Ambition is a part of the Great by Choice Formula will look at it in our next blog.